Could your content disappear from the web? Ask writer Dennis Cooper and you'll find that the answer is Yes. 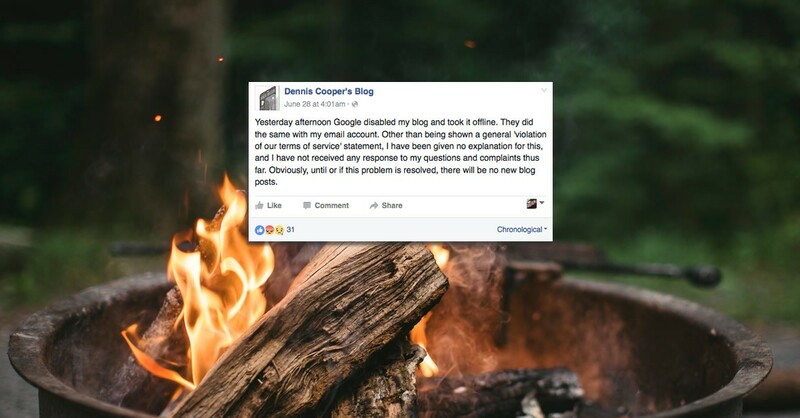 Cooper had hosted his blog on Blogger.com since 2002, only to find on June 28 that his 14 years of work had been deleted by site owner Google, with no explanation. Making matters worse, they also deleted his Gmail account. To date, even after involving lawyers, he's received no explanation other than the stock “violation of terms of service agreement” and has no idea if he'll be able to recover his 14 years of work or his emails. We've long warned clients not to rely solely on free services as their web presence, especially if they update frequently. There are many small businesses who rely solely on Facebook and don't give a thought to the fact that they have no control over their own content. You should never have content on Facebook, Blogger, Instagram, or any other platform that you don't have backed up elsewhere. If you add content to a blog or free site on a regular basis, your own time and creativity is being invested in another company over which you have no control. The amount it would cost in hosting and design to have your own site that you fully control would be minimal compared to losing years of work. In this case the site was on a free platform, but you also incur risks if your site is on a paid proprietary platform. Chances are you can't migrate the site to another host or platform, and there's nothing to protect you if the company decides to stop development of the software. One client we worked with had invested tens of thousands of dollars in a site on a proprietary platform that was then sold to another company. The new company only wanted the client list and stopped providing tech support or new development for the platform. The client could continue to pay almost $15k/year just to keep the site up, but no new system features would be developed and no tech support provided. If your site is built using Open Source software, however, you're not even stuck with the same hosting company or designer. Most Open Source websites can also be migrated to another content management system if you decide you would like to switch. Moral of the story - take inventory of your online assets now, make sure you're protected against data loss, and take a good look at whether you actually have any control over your own website and other online content. Don't know? Get in touch to book an Online Asset Audit. Will the Internet of Things pass your business by?